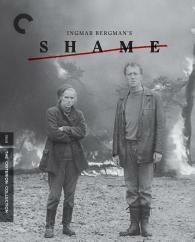 Ingmar Bergman’s Shame is at once an examination of the violent legacy of World War II and a scathing response to the escalation of the conflict in Vietnam. Max von Sydow and Liv Ullmann star as musicians living in quiet retreat on a remote island farm, until the civil war that drove them from the city catches up with them there. Amid the chaos of the military struggle, vividly evoked by pyrotechnics and by Sven Nykvist’s handheld camera work, the two are faced with impossible moral choices that tear at the fabric of their relationship. This film, which contains some of the most devastating scenes in Bergman’s oeuvre, shows the impact of war on individual lives.